There’s one thing nearly all laptops have in common: they seem to always run out of battery power at the worst possible moment. 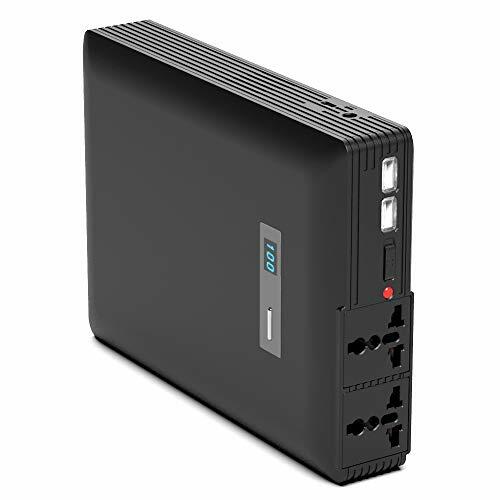 If you depend on your laptop and would like to remain productive even when far away from AC outlets, you need one of the 5 portable AC outlet battery packs presented in this article. 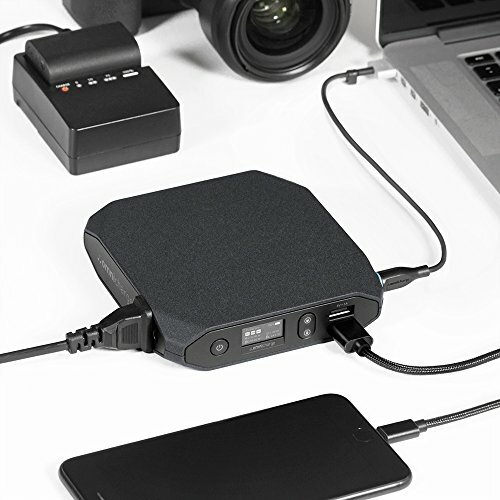 The ChargeTech PLUG is a high-capacity battery pack with two standard AC outlets and 2 USB ports with fast-charge support. The PLUG is capable of providing up to 250 watts of power at 110 volts, and its total battery capacity is 54,000 mAh. For comparison, the latest MacBook Pro with Touch Bar has a battery rated at 12,960 mAh. Inside the ChargeTech PLUG is a sophisticated charging circuit that ensures universal compatibility with all laptops and smartphones on the market. The circuit additionally provides several layers of charging protection, protecting all devices connected to the PLUG from power surges, overcharging, and short circuit currents, among other things. The ChargeTech PLUG comes with a 12-month warranty and a 30-day money-back guarantee, giving you two extra reasons to buy it and experience what it’s like to live a life where the low battery status warning notification isn’t a serious problem. The Goal Zero Yeti is a compact, high-capacity energy storage system designed with outdoors in mind. 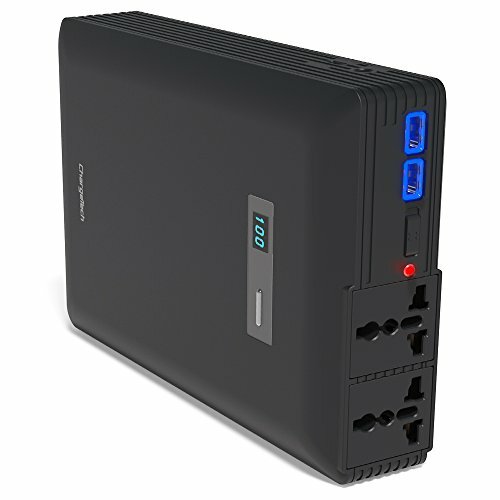 The Yeti has a 428 Wh capacity, and it features just about every port you could possibly need, including two 12 V ports, three 2.4 A USB ports, and two AC outlets. If you’re a fan of clean energy, you can connect the Yeti to the optional Goal Zero Boulder 100 solar panel to remain productive indefinitely even when stranded in the middle of nowhere. Thanks to the pass-through feature, the Yeti can provide power to various connected devices while being charged from the solar panel. Located on the front side of this compact energy storage system is a large LCD that tells how much power is still available and how long it will take to charge the system back to its full capacity. The Yeti utilizes a brand-new battery management system that greatly simplifies battery replacement and introduces several additional layers of protection. Despite its modest size and weight, the Omni 20 from Omnicharge boasts an impressive 20,400 mAh battery capacity as well as a single standard AC outlet, a USB port compatible with Quick Charge 3.0 technology, a direct DC output port, and 11 layers of charging protection. The Omni 20 is controlled by STM32 32-bit ARM Cortex MCU, which cyclically monitors the charging process every 10 milliseconds and instantly responds to any deviances. Located on the front side of the Omni 20 is a small OLED display that shows several useful metrics, including output/input status, remaining battery capacity, battery power input, battery temperature, remaining charge and discharge time, and others. The Omni 20 was designed to meet the needs of people who live a digital lifestyle and depend on electronic gadgets on a daily basis. It’s small enough to be carried everywhere yet so capable that it can reliably supply power to everything from laptops to smartphones to cameras to drones. The goal of the Jackery PowerBar is to overcome the limitations of traditional power banks when it comes to keeping laptops charged and running. Whereas traditional power banks seldom have a capacity greater than 10,000 mAh, the Jackery PowerBar has 20,800 mAh and can provide up to 100 watts of power. It has a single AC outlet for laptop chargers and two USB Type-A ports for smartphones and other mobile devices. One of the two USB ports supports Quick Charge 3.0 technology. Finally, there’s also a single USB Type-C port, which can be used both for charging the Jackery PowerBar itself and for charging other devices. The weight of the Jackery PowerBar is only 1.5 pounds, and its shape makes it disappear in your backpack or the glovebox in your car. Because the Jackery PowerBar has a sophisticated charging protection circuit with several temperature sensors, you don’t have to worry about it overheating when charging under the sun while camping or partying during summer. 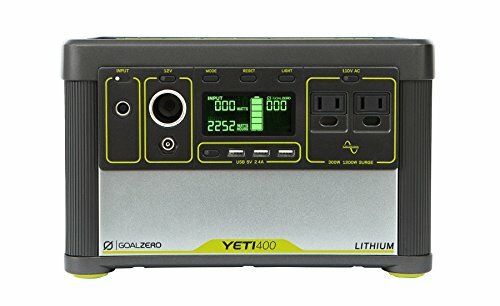 The Goal Zero Yeti 1400 and Boulder 100 kit provides a clean and efficient alternative to 2000 W gasoline-powered inverter generators. 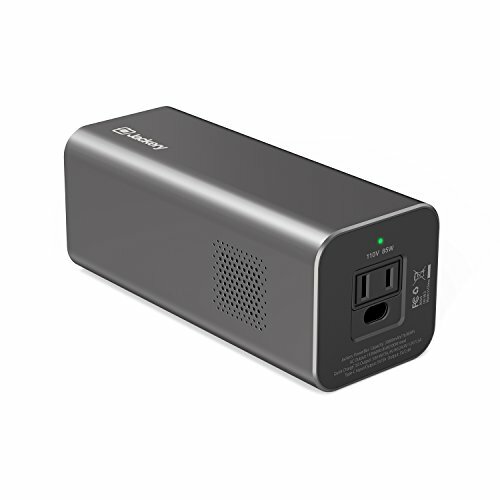 It features a 396,000 mAH/3.7 V capacity and has four USB ports, two AC outlets, and several 12 V outputs for unprecedented charging options. Even though the kit works perfectly fine as an indoor backup power supply, it shines the most when used outside under the sun. 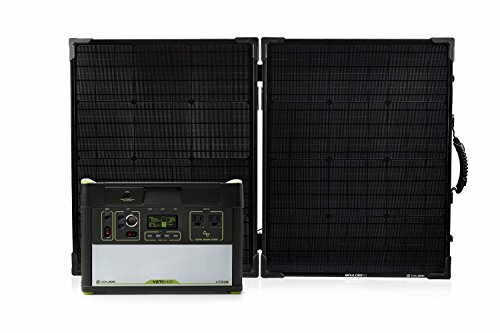 That’s when the included Boulder 100 solar panel can shine and supply the Yeti 1400 power station with clean energy as the station provides power to various connected devices. 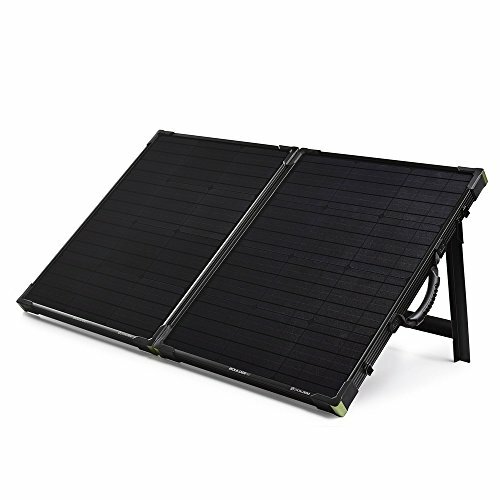 The solar panel has an adjustable kickstand and a sturdy base, so you can place it anywhere and adjust it however is necessary to achieve the best performance. All the charging electronics are inside the Yeti 1400, which means that you can simply connect the two units and start charging.